Great War Wednesday: New Artillery | "Granny Beads and Grocery Store Feet"
Many people view the machine gun as the most iconic weapon of the First World War, the greatest ground based technology employed all the multitude of advances in artillery. For hundreds of years, dating all the way back to China, black powder and its derivatives powered artillery. Black powder was the propellant which sent the projectile on its way as well as the payload packed in the earliest exploding shells. Cannons were cumbersome and slow to load. They had to be served from the muzzle in all but a tiny few experimental iterations and this limited their projectile size and the length of their barrels. Leading up to World War One, however, cannon technology took off in exponential fashion with the advent of new propellants, newer shell designs, reliable breach loading mechanisms, and — most of all — bigger calibers these advances made possible. Artillerymen long looked for something to replace black powder for several reasons. Black powder gave off huge clouds of smoke when fired and this made it impossible to hide a rifleman, much less a billow belching artillery piece, and no commander wanted to give away his gun positions. Also, black powder quality varied tremendously even within a batch. The smallest change in relative humidity could change the burn rate of the propellant, which then affected the range and accuracy of the piece. Most problematic was this wouldn’t be noticed until the shell was fired and by then it was too late. The first leap in artillery came with the stabilization of nitrocellulose or guncotton as a propellant. Guncotton was invented or discovered in the middle of the 19th century along with its close cousin nitroglycerin. Unfortunately, both of these substances were entirely too volatile in their earliest forms to be of real battlefield usefulness. By the time of the Great War, however, guncotton was refined enough and stable enough to use as a propellant. The result was a tremendous increase in the reliability and power of the artillery. The second major development in guns on the battlefield was in the area of projectiles. For years, muzzle-loaded cannon shot one of two projectiles — solid shot or grapeshot. Solid shot, as the name implies, was a single solid ball, first made of stone, then of iron. Grapeshot, however, was a canister of hundreds of smaller balls, often musket ball caliber. When shot, the canister fell away and the cloud of balls acted like a shotgun on massed infantry. The American Civil War saw the first use of explosive cannonballs. These were hollow iron spheres filled with black powder and fused to explode after a certain amount of time or upon impact with something solid. These explosive rounds did great damage — when they worked. With the perfection of nitroglycerin, however, explosive shells became fearsome indeed. A shell packed with nitro or guncotton either one would blow tremendous craters in the earth . . . or fortifications. Canister shot was replaced by shrapnel shells. These new antipersonnel projectiles still featured a multitude of smaller balls, but now they were packed in explosives. The shells would arc high into the air then explode over their targets raining death down on the men huddled in the trenches. The final major advancement in artillery was reliable breechloading. The ability to serve the gun from the rear, or breach, instead of the muzzle meant the gun didn’t have to be lowered for each shot. Leaving the gun in firing position enabled better accuracy for followup shots. Breechloading also allowed for a higher rate of fire since the new shells were in one piece rather than separate powder and shot. Taken together, these advances created the most awe inspiring weapons on the battlefields of World War One. During the American Civil War, the largest coastal defense guns fired a shell which weighed twenty pounds out to a maximum range of about five miles with a fire rate of one shot every three minutes by an expert crew. 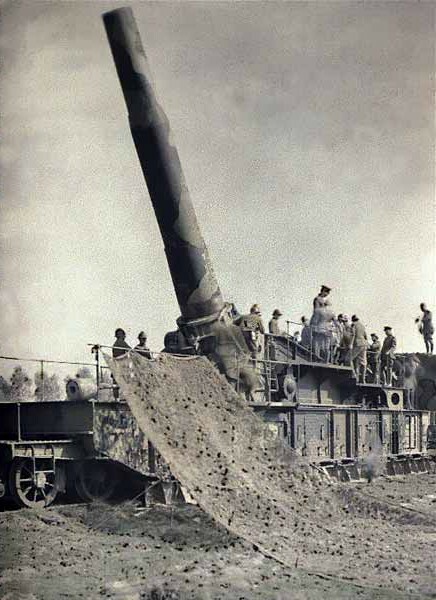 The workhorse of the French Army in World War One, by contrast, the French 75, could fire 15 rounds per minute at a range of five miles with 16 pound high explosive shells filled with mellenite, a particularly nasty explosive to men’s lungs. The 75 was a popgun compared to the true Queens of the Battlefield — the railway guns. Very early in the war, some enterprising German got the idea to take a naval rifle, designed to be used on a BATTLESHIP, and mount it on a rudimentary carriage to fire overland. The result was less than ideal since the carriage was destroyed every time the gun fired and had to be rebuilt, but engineers honed the design and figured out how to mount the guns on a modified railroad car which would absorb the recoil. The result was beautifully horrible to behold. The Germans had the “Long Max” which could launch a 15 inch diameter shell weighing two TONS a distance of 27 miles. The French, not to be outdone, fielded Le Obusier de 520 modèle 1916 that fired a shell TWO FEET across weighing 2.5 tons over ten miles. The damage these guns could do cannot be overstated. One soldier wrote in his diary of seeing a group of 200 men gathered at a worship service in the field being hit by a “German Heavy” and “turning into a red mist” with no single man being identifiable afterwards because not enough pieces could be found. The “heavies” of both sides excavated huge craters whenever they hit. Some pictures we have today show shell holes sixty and seventy feet across. The constant barrage of these guns turned the battlefields into moonscapes and men’s nerves into tapioca. Literally nowhere within range of the guns was safe. A high explosive shell could kill men in trench dugouts placed thirty or forty feet deep under ground. Love y’all, keep those feet clean, and remember the fallen with honor.